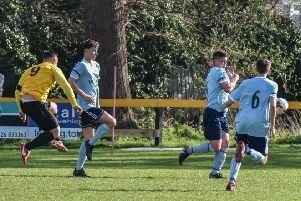 Leamington Hibs are celebrating after clinching the Midland League Division Three title in their final match of the campaign. After slipping up in their penultimate match against Stratford, long-time leaders Hibs needed to beat Perrywood to pip Smithswood Firs to top spot. And despite falling behind to an early penalty, the hosts recovered to win 5-1. Sam Smith drew them level, also from the spot, before Joe Wright rounded the keeper to make it 2-1. Second-half goals from Jack Keeley, Luke Swinnerton and Will Pendred then ensured the celebrations could begin in earnest. And, following on from years of struggle for the club, the influx of a new management team and players from Stoneleigh FC proved the catalyst for the success according to player-boss Daniel Bates. “Merging the best of the previous squad and my current set of lads helped us to get off to a good start and stay under the radar as many teams expected us to be easy pickings as Hibs were before,” he said. He added: “I’m proud of my lads’ attitudes. All of them were spot-on this season.